Absurd Minds Gaming -- absurdminds.net: Official Review: Glorious Gaming Extended Mousemat. Official Review: Glorious Gaming Extended Mousemat. Last month "Glorious" reached out to the users of Reddit's PC Gaming communities. Being an avid browser/contributor of /r/globaloffensive combined with my obsession with "Gaming" mice, I knew I had to give my two canadian cents on the product. Talking to the friendly representative via public and private messages resulted in a fantastic brainstorming session. We talked about texture, size, design, and most importantly performance. You see, I have a problem. I must at all times have the best performing peripherals, and a good mouse/mousepad combo is by far the biggest contributing hardware factor of maximizing your performance in an FPS game. CS:GO is among the top tier of FPS titles that require a consistently accurate input system. I am the guy you hate. I spend hours reading datasheets and spend hundreds buying as many mice as my wife will allow me to. I will point out that your Laser mouse is hindering you, because it is true. It is science. Yes there is a difference between Laser and Optical, and yes, by design, one is better for FPS gamers. However this is not a debate, it is a review of a mousepad. 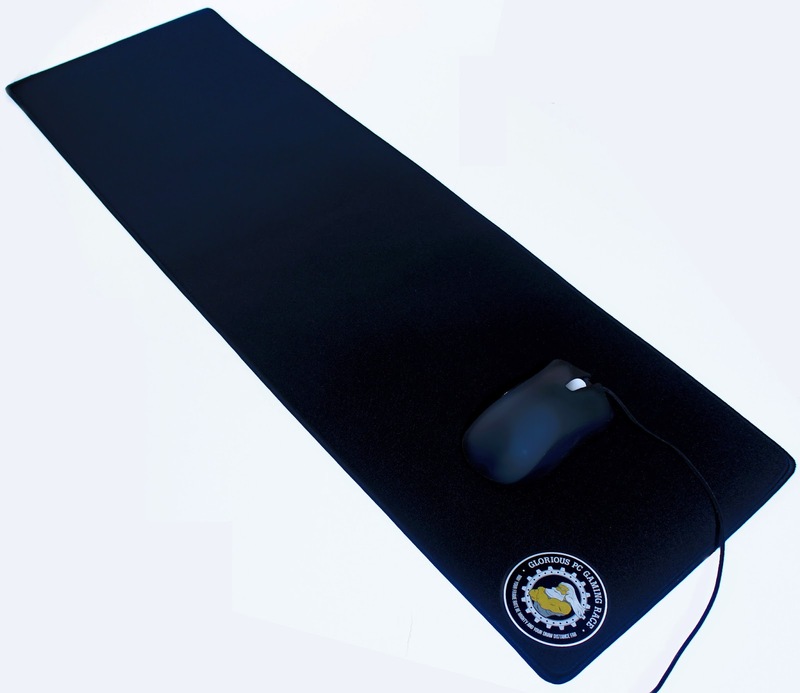 The Extended Mousemat is aimed to be an affordable quality desk pad, and initial impression is exactly that. For $14.99 USD it is the cheapest desk pad I could find. The company put their capital directly into the product itself. They don't have fancy packaging, and they don't spend thousands on marketing. The size is as advertised 36"x11" which for me was a chore to get used to. For the better part of a decade, I have been using a Steelseries QcK Heavy (17.7"x15.7"). However, after a week or so I adjusted my posture and playstyle and was able to effectively use the given space of the Glorious. Cloth is the material of choice for most of the gamers I associate with (CS/Quake players) but that doesn't mean that all cloth pads perform the same. Glorious uses an extremely fine weave to acheive what is considered a "Speed" surface, similar to the Razer Goliaithus Speed version. Overall the mousemat looks fantastic. It is "a sharp piece of kit". My Keyboard and mouse look amazing on it and I love having a soft surface under my arms. However, the logo, while not really hindering 90% of movement, is a little too large and it definitely will drag your mouse if you happen to hit it with a flick or 180 degree turn. The logo also may be a little "too much" for some people esthetically. It is rare when a product actually meets my expectation, even rarer when it exceeds them. The edges have fantastic stitching to prevent typical cloth pad fray. While I have had other mousepads that have this feature, they are always more expensive, and in the case of the Zowie GTF, the edges caused the mousepad to lose grip and slide across my table. Not the case with the Glorious, the base is rubber and grips very well. Dude to being rolled the mat does have slightly raised areas, but every day of use causes them to settle more and more. I expect another week or so have it completely flat. What can be said about the performance of a black cloth surface? I used the Zowie FK, the Zowie EC2 eVo, the Razer Deathadder and the Steelseries Sensei for testing. None of these mice have any angle snapping and only the Sensei has any form of acceleration. Nothing changed while using the Glorious. Yes, I've tested with Enotus, MouseMovementRecorder and tried to see if any jitter was present on higher CPI level. There was nothing of note, and any differences of malfunction rate can be attributed to my own hand speed at the time. Aside from my Zowie FK freaking out when moving on the logo, I could not get any unfavourable mouse response to happen. This was a shock as my QcK Heavy would cause the Sensei to stop tracking every few minutes during slow movements. The smaller weave is probably the biggest contributing factor to that result. I don’t foresee any mouse having a problem with this surface. Glorious PC Gaming Race, did something I haven’t seen in years. They made a product for the gaming community. After a solid month of using this, will I switch permanently from my favoured QcK Heavy? No, I won’t. However, this is just me. I do not need a desk pad, and I still prefer the height of the QcK Heavy. Don’t get me wrong this is a great product, for the right person. There is a certain niche that will adore this product. At retail this goes for $14.99 plus S/H, which they offer at $4.99 anywhere in the US.